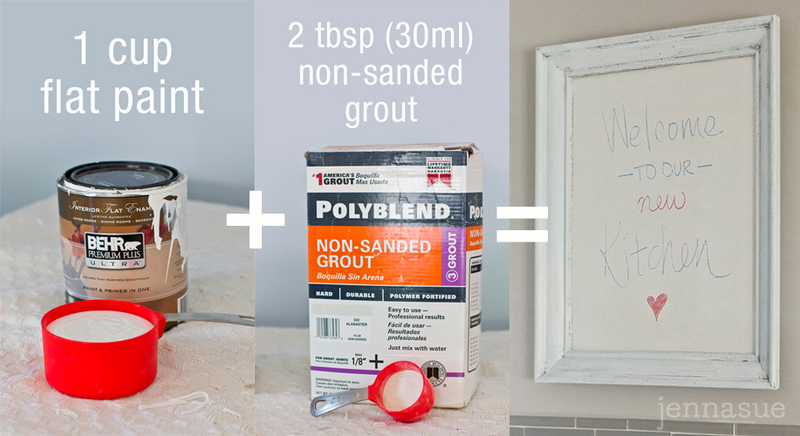 By now, we’ve all seen chalkboard paint everywhere. 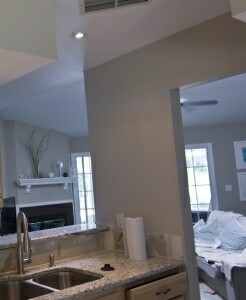 It’s all over pinterest and blogland, in our kitchens and offices and even bedrooms and bathrooms. From spray paint to DIY concoctions, in shades of gray, red, pink and blue and everything in between. But I have never, ever seen one in white. Not that a nice charcoal grey would have bothered me, but I figured if I was making my own and could choose any shade in the world, why not white? 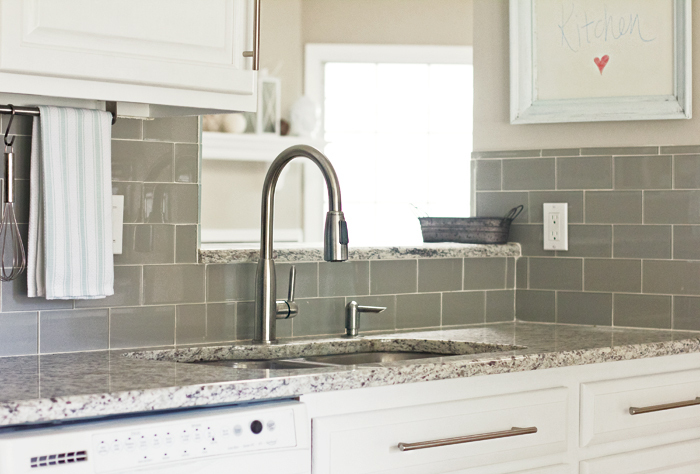 If you’ve been around this blog long enough, you’ve probably noticed white is my go-to color. It’s clean and timeless—you just can’t go wrong. then a coat of pale turquoise (same shade as the tea time sign and flower bucket), and in a matter of minutes it was good to go. I apologize for the horribly lit picture. It looks white here, but I assure you it is a very soft turquoise. Next it was time for the chalkboard. 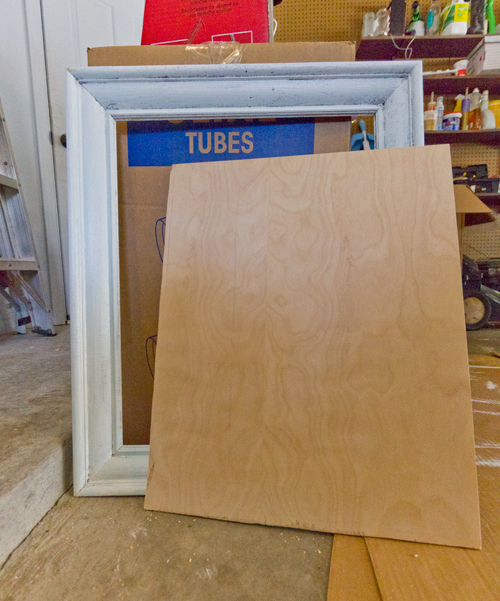 I picked up a thin piece of plywood at Lowe’s and we used a jigsaw to cut it to size (18×24″ in this case). 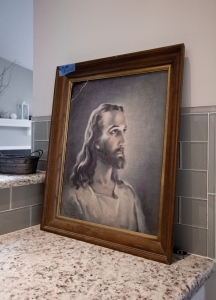 Next, it was time for the chalkboard paint. I used materials I had on hand: Behr’s flat paint (in white) and unsanded grout that we had leftover from our bathroom tile. 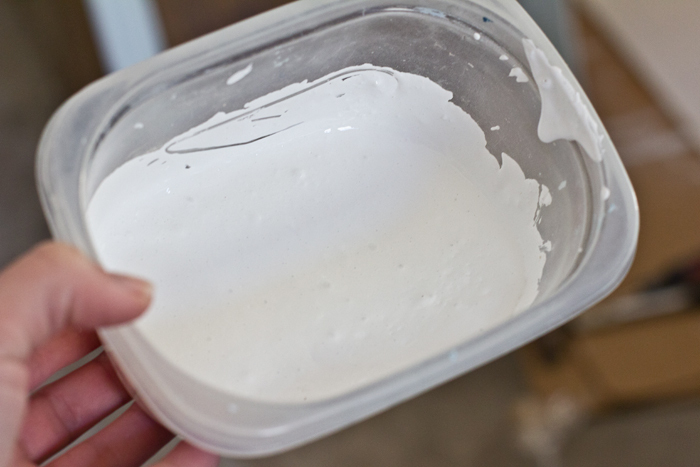 After thoroughly mixing, I was ready to apply the mixture to my board. 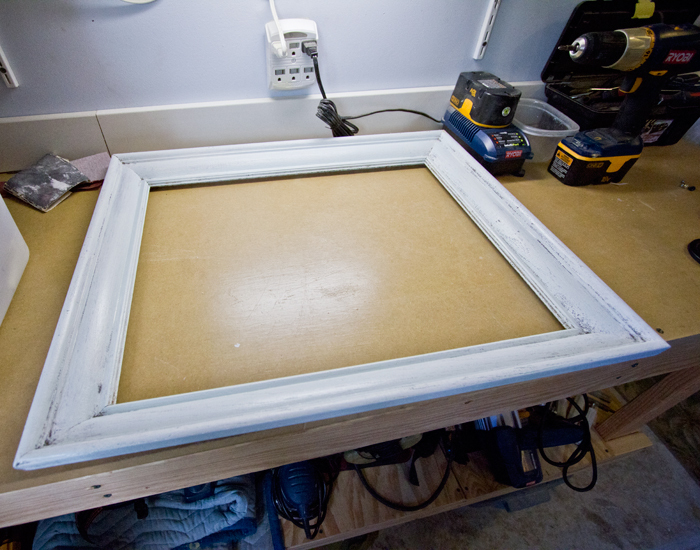 I wanted to get this right, so I carefully sanded in between coats until it was completely smooth. I ended up using 3 solid coats when it was all said and done. 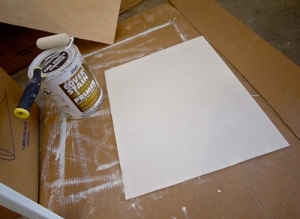 After the paint is fully dry, you are supposed to “prime” the surface by dragging the flat side of chalk along the surface until it is completely covered, then wiping down with a damp sponge. This step did not go as planned for me. I did not have any white chalk on hand, so I grabbed the closest shade: yellow. Instead of simply wiping clean, it stained the surface so I was left with an off-white chalkboard. I ended up having to scrub it down with lysol, and re-prime with white chalk. I’m not sure if darker colored chalkboards run into this problem… but perhaps this is why no one has made a white chalkboard? Anyway, the chalkboard still “works”, but there are still markings and smears of color when I wipe with an eraser. 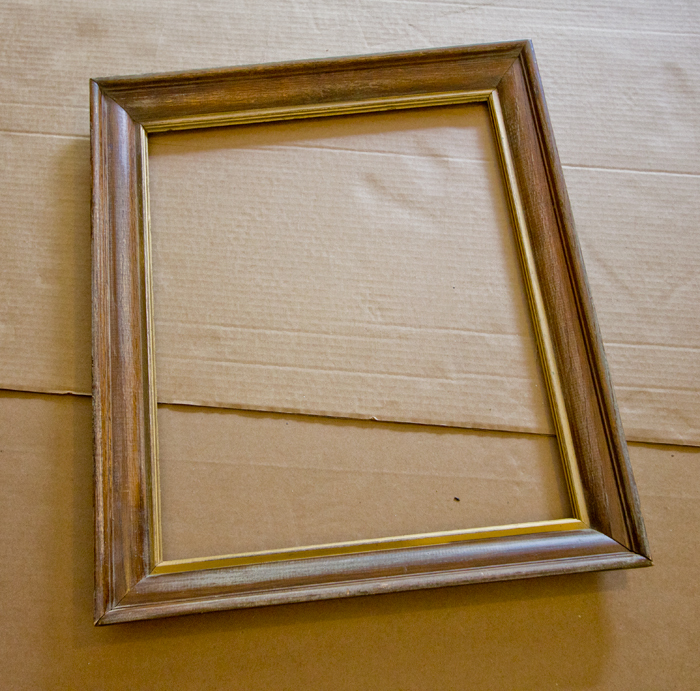 I have to use cleaner to actually remove the pigment from the surface. I imagine this isn’t as noticable on a darker surface. Still, it was worth a try. 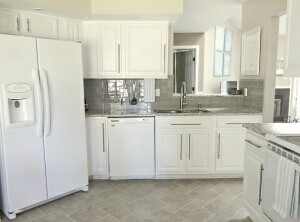 I love the way the white looks in the space! Can’t beat it for under $10! I encourage you all to try your own, and report back to me on how well the formula works for you. I’m interested to know if it’s as good as the store bought stuff. love the distressed look of the frame! I've made the DIY CB paint in black and I was having some of the same issues you've described here. So, I checked out the ingredients on the real CB paint and there's not limestone in it at all. It's all synthetic materials. So, I'm going to give it a shot since I'm wanting a black chalkboard anyway. 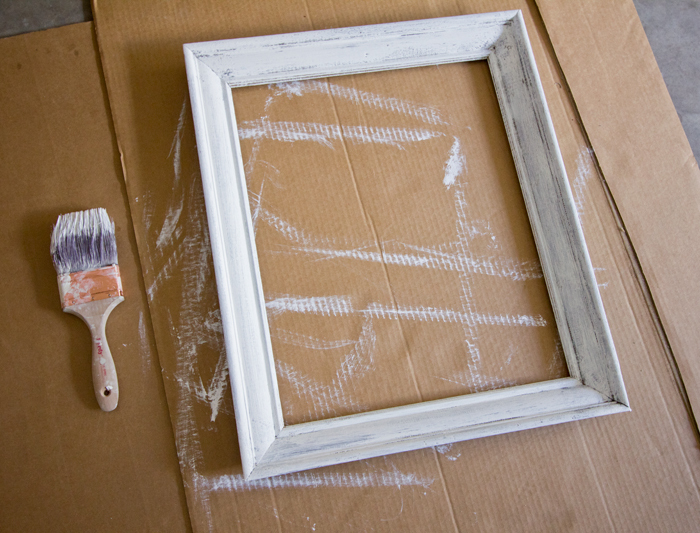 Unfortunately I don't think store bought white CB paint exists, so I will have to stick with what I've got! Great idea! 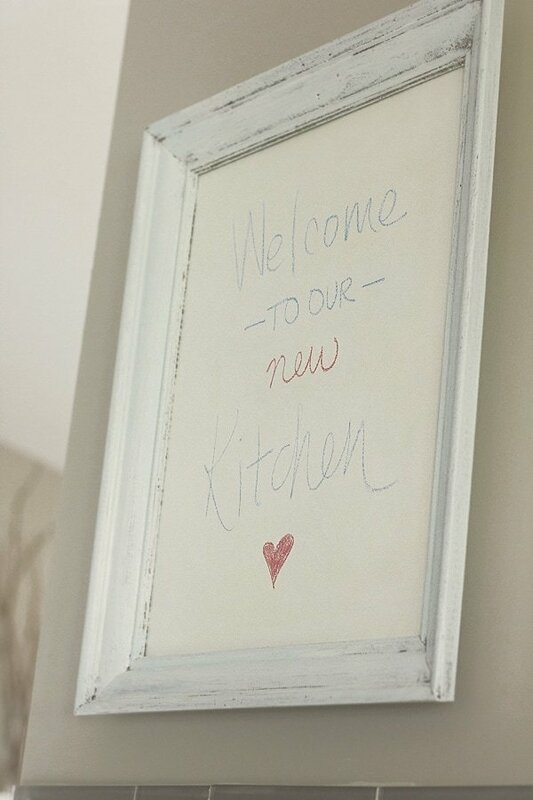 The white chalkboard looks great in your kitchen- which is beautiful by the way. 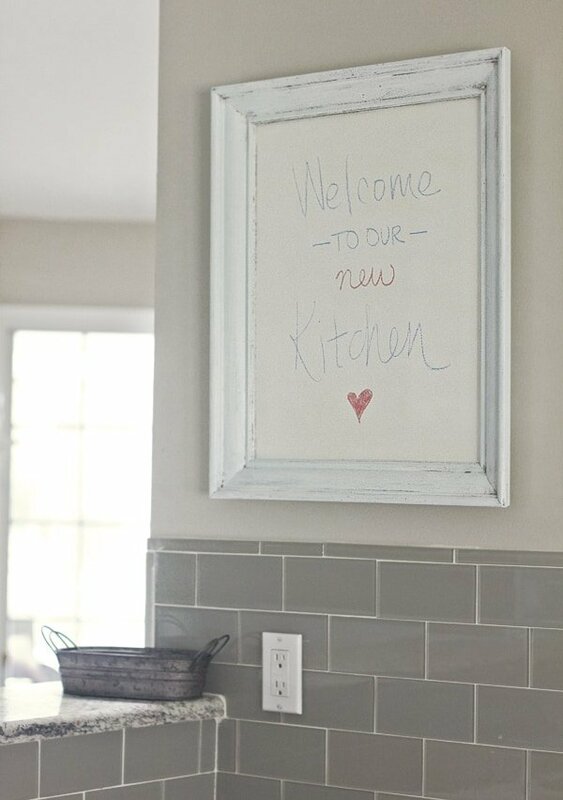 It almost looks like a dry erase board at first glance, but much more sophisticated! I just popped over from YHL! And now I'm hooked on your house! I've been reading thorough all of your posts! Your home is beautiful! Hi, I was checking out your California house and I have a few questions, if you dont mind answering. What type of lighting you used for your back and front yard? Is it solar? Do you have the model? Also, I love your curtains and couch, where did you get them? New follower from young house love….curious about your dark wood floors? noticed you had carpet in early pictures, but couldnt find post about them? Hey! I found you through YHL and I love your home — all the white is so fresh and airy! I'm also checking out all your awesome projects. P.S. we're fellow Jacksonville-sonians; I live over at the beach.